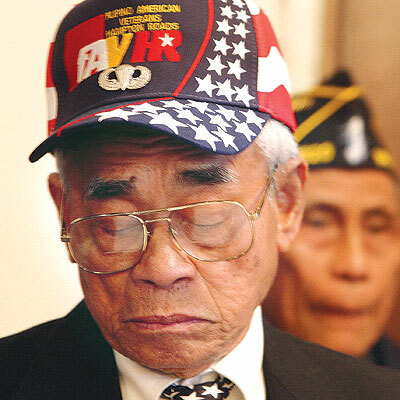 The Filipino Veterans Equity Bill is at risk in Congress, leaving Filipino veterans of WWII stripped of their U.S. veteran status, even though they fought for our country. This injustice has gone on for more than 60 years and many of these veterans may pass away before seeing their sacrifices recognized. Filipinos for Affirmative Action asks you for your urgent support in calling Members of Congress and urging them to support this bill. The leadership of the Senate and the House need to know that they must pass the current bill, S. 1315 in the Senate, and HR 760 in the House, and opposed amendments that would water down the legislation. Our veterans deserve nothing less. Send a letter of support now. 2. Contact Senate and House leadership and urge them to bring the bill to the floor for a vote. It does not matter if you are not in the district of the member of Congress you are contacting. Tell Congress how important the Filipino Veterans Equity Act is to you. If you are directly connected to a Filipino veteran, let them know the impact this bill has for you. The 1946 Rescission Act took away US veterans status promised to them and the Filipino Veterans Equity Act will not only restore this status, but will give them the honor and recognition of their service that they deserve. Nationals from more than 60 other countries receive US veterans status; Filipinos were singled out for discriminatory treatment. All of our veterans deserve to be treated the same way; we are committed to full and equal benefits in line with what US veterans currently receive. Pass the Filipino Veterans Equity Act NOW! For more information, please feel free to contact us at (510) 465-9876.